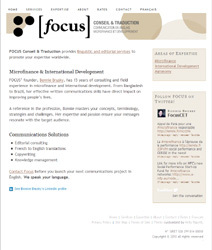 Bonnie Brusky, an international development pro specialized in microfinance, was launching her consulting and translation business and website. Nothing is harder than writing your own web marketing copy and for Bonnie’s voice to shine through, we had to take a few steps back before setting a strategy and developing the content. Copywriting the English version of the website came first, followed by its French adaptation.